The universal character of AVS Video Converter is probably the main secret of its popularity. This compact tool is ideal not only for converting files, it can also be used for simple video editing and burning the resulting videos to discs. 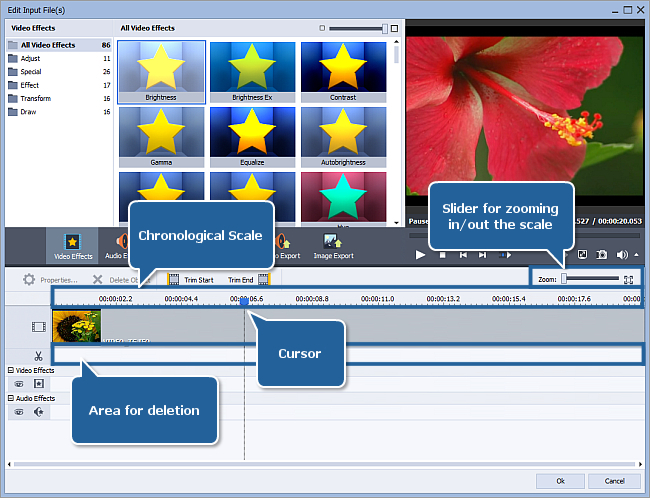 The Edit function is the one that causes most of the questions as it implies working with the timeline. The following guide will give you some tips on editing video with AVS Video Converter, in particular, on how to delete unnecessary parts from files. 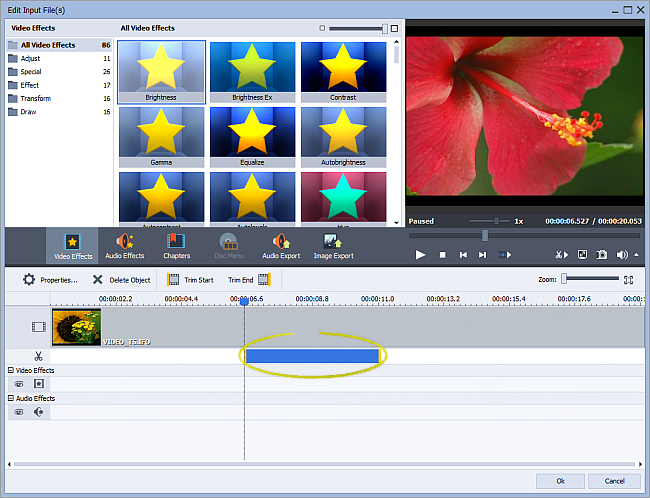 Once the input video is loaded, press the Edit button on the Main Toolbar to open the Edit Input File(s) window. The Timeline Scale in the upper part of the Timeline shows the file in its chronological sequence – in hh.mm.ss format. Use the Zoom slider on the right to zoom in or zoom out the scale. 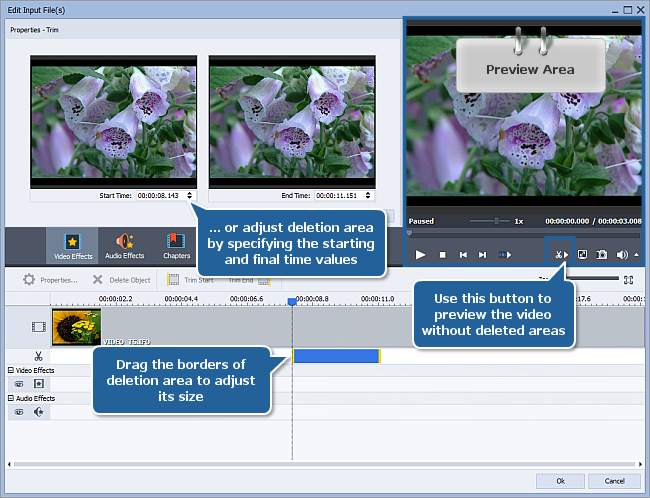 The Preview Area located in the right part of the Edit Input File(s) screen allows you to visually control the editing process. The current position of the cursor is always displayed in this area. By default it displays the very first frame of the video you imported into the program. 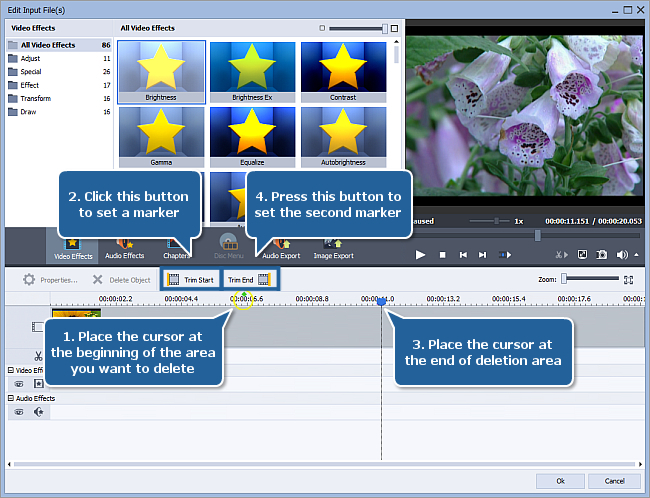 Navigate the file (use the tips provided at Step 3) to find the initial moment of the episode you wish to cut out. Left-click on the timeline to place a cursor. Use playback controls located in the Preview Area, hotkeys or simply drag the cursor to adjust its position. When ready, press Trim Start right above the timeline to set the initial point of the area you wish to delete. Perform the same actions to find the final point of the area you wish to delete. Press the Trim End button to set a marker. As soon as you set the second marker, a blue-colored area will apprear in the Deletions area highlighting the deleted part on the timeline. Note: you can add more than one area of deleting to your video just by going through the same procedure once agan. The active area of deletion is marked by yellow stripes at the limits of the area. Drag the borders of the area of deletion with the mouse. Adjust the borders in the Properties - Trim window. Double-click an area of deletion to access this window. It will be displayed in the left part of the Edit Input File(s) screen. The Properties - Trim screen contains 2 windows which display the initial and final points of the area of deletion. Use the arrows or enter the hh.mm.ss manually to adjust the borders of the area. After you convert the file all the areas marked this way will disappear from the resulting file. To preview your video without the selected areas for deletion first press the Preview Trim Result button in the Preview Area, then click the Play button. After you have set all the areas of deletion, click the OK button to accept the changes and close the Edit Input File(s) window. It will bring you back to the main screen. Configure conversion parameters as you need and press Convert Now!. Wait while the software converts your video. It might take up to several hours depending on your computer capabilities. That's all! The edited video of a new format is now ready to be watched.